Wanna know the secret(s) behind your favourite K-idol’s flawless skin? It's a pretty well-known fact that most of Korean society really, and I mean really, take care of their skin. So much so that having the “Korean look” has now become a worldwide trend. Ask around and you’ll realize that nowadays, having dewy, youthful skin has almost become a universal skincare goal. Hence, it’s no surprise that Korean skincare brands are really killing the skincare game, especially thanks to their gentle-on-the-skin formulas and attractive packaging. So, what are you waiting for? 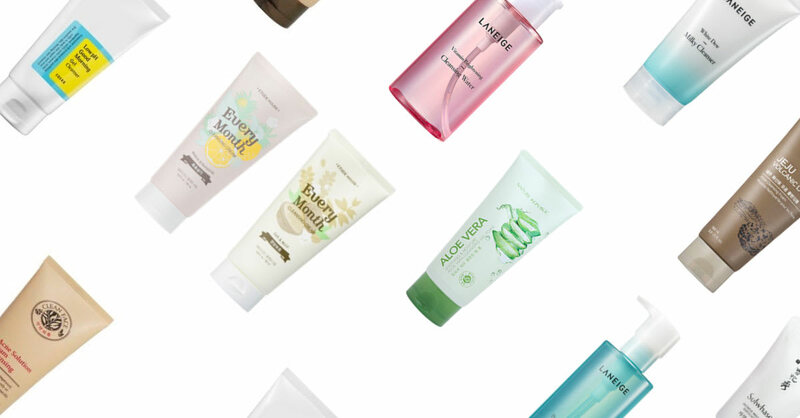 Here are 9 of the best Korean facial cleansers you wouldn’t want to miss out on! This product is a weak acid, with a pH of 5-6, which is similar to that of skin, so it is able to work its magic without irritating the skin. It also contains tea tree for regulating oil and sebum levels as well as natural BHA unclogging pores. The gel consistency is soothing to the skin, effectively keeping it hydrated throughout the day. Rest assured, this gentle formula won’t do you dirty. Made of 90% aloe vera and enriched with skin-friendly ingredients like vitamins C and E, as well as minerals, this product will keep dry skin hydrated throughout the day. Not to mention, it will also help in soothing skin redness and irritation, which is perfect for those with more sensitive skin. This special water-based cleanser contains antioxidants like acerola and acai berry extract, modified using Laneige’s Silicium capturing technology for 4 times the antioxidant effect compared to regular vitamin C, keeping your skin youthful and vibrant. It also contains natural ingredients derived from corn extract for moisturized skin that effectively removes makeup. Using sophisticated whitening technology, this product combines mela-vita crusher with saururus chinensis extract as well as phyto sugar water to smooth out the skin complexion and reduce dark spots. The gentle ingredients derived from plants work by cleansing skin with minimal irritation. Another reputable product, this cleansing foam contains actual volcanic ash from Jeju Island which controls sebum levels by binding to sebum and removing them from your pores. It also contains what is called a “City defender complex”, which are basically 3 natural leaf extracts that work together to tighten pores, hydrate the skin and enrich it with various minerals for healthy and bright skin. This cleansing cream from Etude House will cleanse your skin of all the dead skin cells and dirt stuck deep in your pores, without stripping it of moisture. With 12 moisture-enhancing ingredients, it will keep your skin glowing and hydrated. Sounds counterproductive to use oil to cleanse skin? Think again. With a structure similar to sebum, this product makes use of its oil texture to bind to excess sebum and blackheads, melting them right off the skin. Consisting of virgin coconut oil and mugwort extract, the formula also allows effective removal of makeup and cleansing of the pores. Show acne who’s boss with this anti-acne cleanser from the Face Shop. It contains natural green tea extract, which deeply cleanses acne-prone skin, ridding your skin of excess oil and sebum for notably clearer skin as time progresses. This product is packed with ingredients that will leave your skin feeling clean and refreshed. Such ingredients include white ginseng powder and walnut shell powder, which takes care of all that nasty dead skin. Your skin will still remain comfortably moisturized thanks to the traditional Korean herbs contained within this cleanser, making it great for combination skin. Big fan of pan mee and high 5's.